We’re going to need to work together on this one. What helps us conserve water during a drought, and why do we not take more steps to conserve water? At a recent meeting of water suppliers and municipalities in Grand Forks to discuss the drought situation and potential responses, I introduced some ideas about what motivates water conservation, framed as personal reasons people don’t conserve. We had a good conversation about what these ideas mean for how we develop the short and long term water conservation strategies – more on that later. “It’s not a problem.” I’ve heard this quite a bit on social media, letters to the editor, and even public meetings. People aren’t aware of their connection between their water use and the state of the Kettle River, or they don’t believe that they have enough impact, either way, to start conserving. There certainly is a problem. The Kettle River and many of its tributaries are flowing very low right now, after a low snowpack and early spring freshet. The region (like much of southern B.C.) is at a Level 4 drought, and any excess water use from surface or ground water reduces available water for fish, water quality, aquatic ecosystems, and downstream use. This seems like it should be easy to fix – more education! More signs, more media coverage, more pamphlets. Many of the water suppliers are already working on this. Awareness certainly helps, but it turns out there are many more barriers in the way to water conservation. Indeed, awareness without other measures will only motivate change for some people. “No restrictions are in place.” According to water supply managers at the meeting, restrictions are having an impact on overall water use, with many people even going further to allow their lawns to go dormant. However, the provincial government has so far only requested voluntary reductions of 30% or more, and only some of the water suppliers have a drought response plan that restricts outdoor water use. Furthermore, provincial regulations currently only affect surface water licences, even though using ground water from sand and gravel aquifers has a direct impact on surface water levels. New regulations coming under the Water Sustainability Act could go a long way to improve our drought response, together with active efforts at compliance and enforcement by water suppliers and local and provincial governments. They will need your input to get these regulations right – future columns will highlight proposed changes. “My neighbours are all still watering.” The ‘neighbour effect’ cannot be underestimated. People are highly motivated by peer pressure and shared ideas of right and wrong. 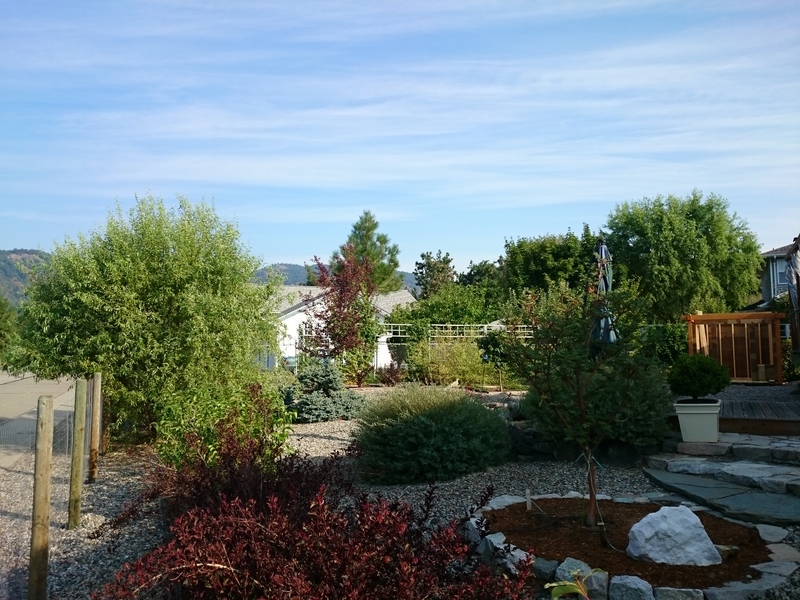 So taking visible steps to reduce water use – allowing the lawn to go dormant, installing drip irrigation, planting a dryland (xeriscape) garden – will go a long way to shift attitudes in your neighbourhood. “I pay the same no matter how much I use.” Paying a fixed fee for any utility or resource just doesn’t make sense to me, especially when that resource is scarce and connected to many other valuable uses. People who save water will also value saving money on their utility bill, and people who want to use more can feel good about paying their fair share. It will be up to water suppliers how they make this work, through water meters or through more radical measures such as paying people to remove lawns or install drip irrigation and greywater systems. Caption: Margaret and Robert Silva have planted a dryland (xeriscape) garden in place of lawn, avoiding using tens of thousands of litres of water per year. Drip irrigation and careful hand watering has reduced their outdoor water use even further. “I don’t know how to…” Fill in the blank – reprogram the irrigation timer, install drip irrigation, plant a xeriscape garden. Helping people learn new skills of water conservation will not only help them save water, it will ripple outwards through the neighbour effect. So water suppliers should start to work together on building skills for water conservation with demonstration gardens, hands-on workshops, or in-house instruction. Community members could also share their successes through public demonstrations and garden tours. “It’s too expensive, complex, or inconvenient to change my system.” This turns out to be a big one, because large farms and businesses have complex, expensive water and irrigation systems already in place. They also use a lot of water compared to households and domestic gardens. It makes sense to support farmers and others in installing more efficient irrigation equipment, sharing costs or providing incentives through programs like Environmental Farm Plan. Bringing all of this together will take time, effort, and a shared understanding of the role of water conservation in a healthy, resilient Kettle River Watershed. We will develop long-term strategies at future meetings of water suppliers. How will you fit in? Graham Watt is the coordinator of the Kettle River Watershed Management Plan for the Regional District of Kootenay Boundary. Contact Graham at plan@kettleriver.caor 250.442.4111. 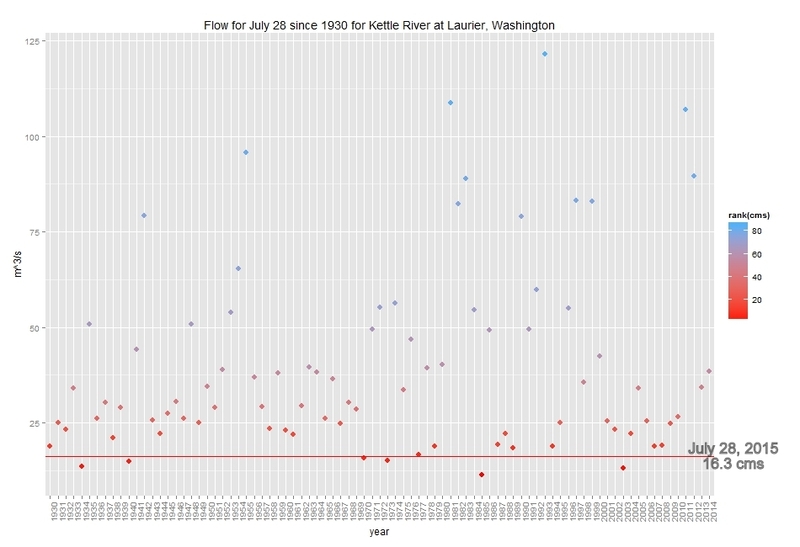 Kettle River near Westbridge (08NN026) is currently recording a flow of 3.92 m3/s, which is 24% of the median flow (3rd percentile) and close to the recorded minimum flow for this period of time. Granby River at Grand Forks (08NN002) is currently recording a flow of 3.49 m3/s, which is 25% of the median flow (2nd percentile) and below the recorded minimum flow for this period of time. From the perspective of protecting water quality, aquatic ecosystems, and downstream water users, it is critical that water users and water suppliers implement strong water conservation measures in the near future. The Kettle River Watershed Management Plan (http://kettleriver.ca/watershed-management-plan/) identified the need for water suppliers to work together on water conservation, drought preparedness and response, and long term water supply planning – this drought is a trigger to start the conversation. What do you think our priorities should be in the discussion? What is the role of provincial regulations about environmental flows and groundwater licencing, and how should local stakeholders, regional partnerships, and First Nations be engaged and provide consent?